Over the past month I´ve really gotten into 78rpm records and swing music. 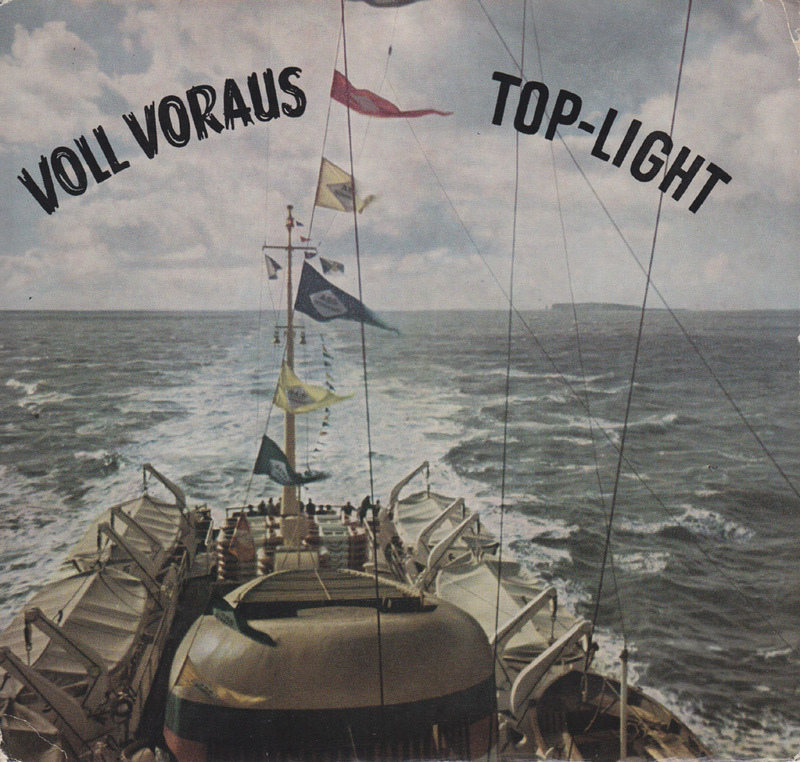 Suddenly the less than 50 shellac records I´ve recently accumulated are much more exciting to me than the thousands of 45s I have in my collection. Also more exciting than the boxes I´ve filled with odd and never re-released 45s for this blog. So what do I post next? More scratchy 78s? Not until I find a better way of recording them. As much as I like to listen to the shellac records on my record player, so far the results of my digitizing are painful to listen to. While searching in my collection for something to get me at least a little bit inspired I found these records. They make a transition from the early to the late 50s. From swing on 78rpm to swing on 45. 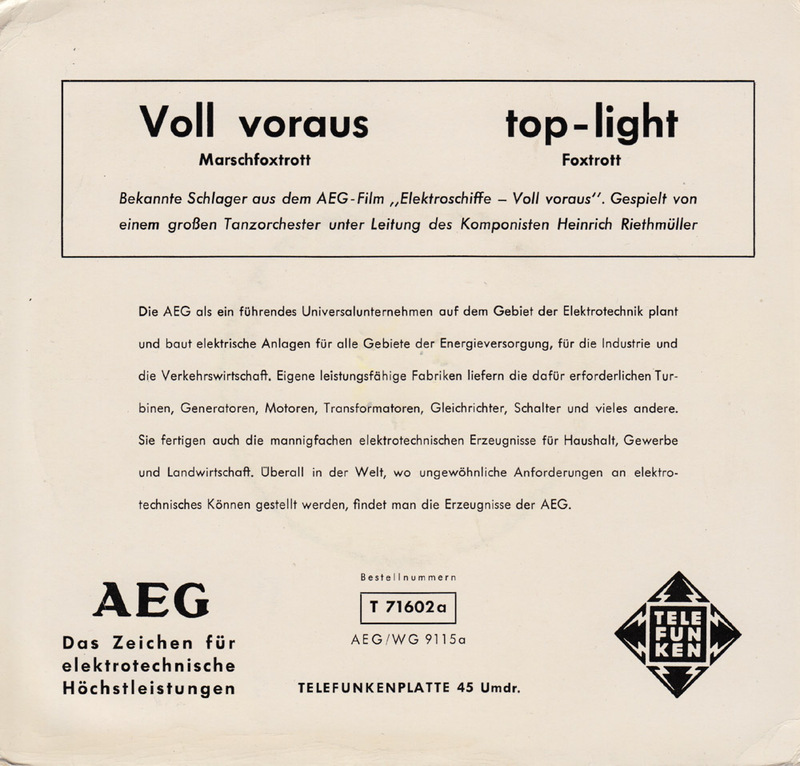 Some nice up-tempo swing music on Top-Light by Heinrich Riethmüller and his orchestra from an advertisement record for the film “Elektroschiffe – Voll voraus” (full ahead) produced by the AEG company, proudly showing all of the electrical equipment on the electric-diesel ship “Wappen von Hamburg”. A quick look at Wikipedia revealed that it is currently being renovated in San Fransisco, California. The new owners even made a cool blog about the history of the vessel. The main problem with your 78 transfers seems to be the stylus you use for playing them. All 78s will sound crappy when you play them with a microgroove/LP stylus: 78 grooves are four times as wide as LP grooves, and the narrow point of an LP stylus wobbles in the wide groove without reading the soundwaves precisely, hence the distortion and lack of sonic detail. There are several manufacturers that provide special 78rpm styli (65 micron wide) for their standard DJ cartridges, e.g. the Ortofon Concorde and the Shure MC35. If your local hifi dealer doesn’t have them in stock you can find them from several Ebay shops. Such a stylus will set you back about EURO 50, but it’s certainly worth the expense! With the proper stylus, many post-WW2 78s will sound better, with fuller and “punchier” sound, than your usual 45s. Thanks a lot, that´s what I thought. Most of the 78s I have, seem to be in okay condition and they sound good when played on my old record player from the early 60s. Unfortunately I can´t plug this record player into the computer or an amplifier. I´ll try to find a proper stylus for the record player that I use for recording next week. Yesterday I found a bunch of very funny Danish cowboy/western-swing records. It will be so much more fun to be able to record them properly. The old three-speed record players usually had a switchable cartridge with both “M” (microgroove) and “N” (normal = 78) styli, and as long as the cartridge itself is in good order they sound OK with both types of record. With modern turntables you have to change the stylus or the cartridge manually – if you are regularly playing both types on the same turntable, you might think about buying not just a 78 stylus but a separate cartridge and headshell, which is much more convenient to handle, and less prone to being damaged or lost, than the small stylus on its own. Have fun with your 78s – there’s millions of tracks out there in this format that you just cannot find on 45, LP or CD! Der Übergang ist gelungen. 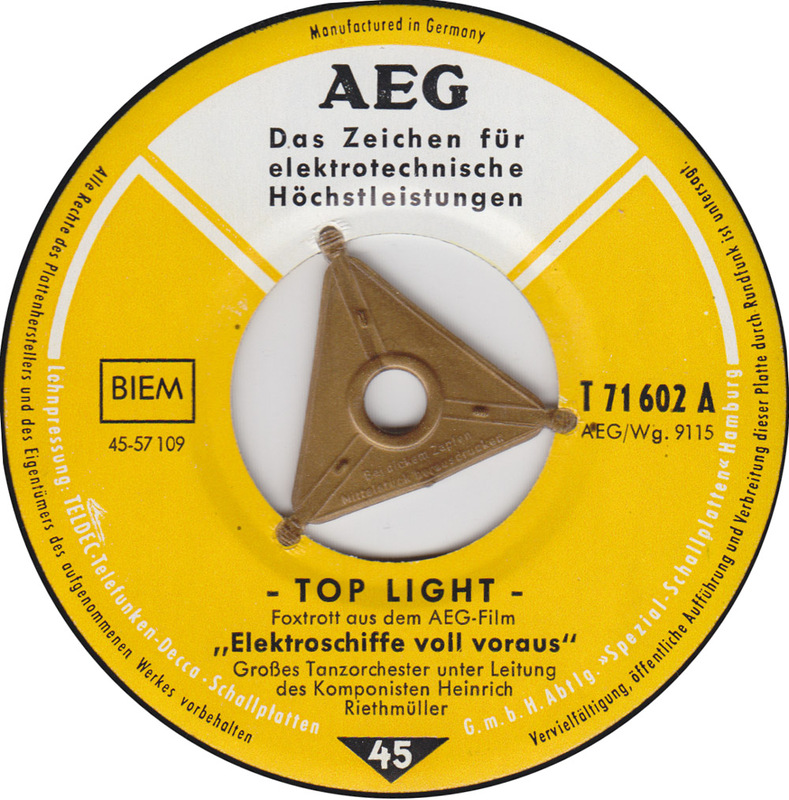 Top-Light ist ein echter Kracher. Klassischer Bigband Sound der späten 30er Jahre. Ist Riethmöller auch der Komponist? komm mal bald zurück, wir vermissen dich! Zum Song: keine Ahnung, ehrlich gesagt. Aber “unter Leitung des Komponisten Heinrich Riethmüller”, wie es auf dem Label steht, klingt danach, daß er das Lied auch geschrieben hat.